I had a pleasant stay while I was in Dipolog City because of Restreto Inn & Cafe. Their very attentive, patient and accommodating staff were a plus, most specially Juvy, whose been very informative and very helpful. The Inn was located a bit far from the city proper. It's based in Brgy Minaog within the Shell Gasoline Station compound. Judging from the location, it seems like an old grocery store of a gasoline station, transformed into a travelers inn. Despite the location, the rooms look so homey, although the Standard and Deluxe Rooms doesn't have windows. During our stay, we stayed in a Deluxe Room for 2 nights and experienced the Suite Room for a night with 2 other travel bloggers. The Suite rooms, compared to the Deluxe and the Standard room has their own windows, but you wouldn't really want to peep on it because of there is no impressive views anyways. They also have their own Coffee Shop. They serve brewed coffee and other liquids. They serve meals too. They do have 1 free breakfast per room. So If you have someone with you, you can probably split on the second meal. Hehehehe but it's only for the breakfast meals. If you ordered a different dish that will cost you an extra charge. *with the inclusion of 1 free breakfast and free airport transfer. You have your own land lines, wherein you can call other guests in their rooms or call someone in Dipolog. So check out Restreto Inn & Cafe on your next Dipolog Trip. Have you been in Dipolog City? Where do you usually spend your nights in Dipolog? See you in my next Purple Slippers Adventure. 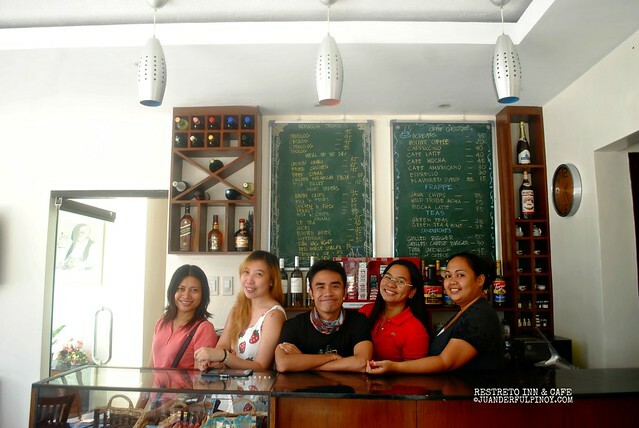 Restreto Inn & Cafe is the official residence of the Pinoy Travel Bloggers for the Hudyaka Zanorte Festival 2012.